Hours: 6:00 am - 9:00 pm • Every Day! 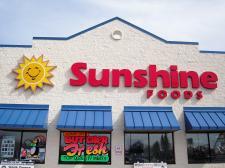 Sunshine Foods is locally-owned and locally-involved! We believe in community involvement and supporting one another. Call us and ask about our Booster-Club Discounts, Script-Card Discount, and other fundraising ideas. If you'd like to receive our weekly ad via email, you can do so by providing us with your email address on our Subscriber Page.